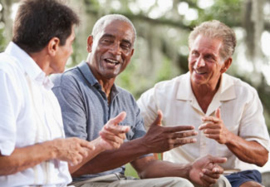 CPCC publishes a bimonthly newsletter about prostate cancer, calendar of events and video lending library available to prostate cancer support groups. If you wish to be put on the email distribution list please subscribe on Home Page. CPCC is a 501(c)(3) organization and as such all contributions you make to CPCC are tax-deductible. Since we are an all-volunteer organization, we need financial resources to keep up our work including making essential information on prostate cancer available to men and families in California, holding annual support group leaders workshops, publishing a bi-monthly newsletter, maintaining our website, sponsoring educational conferences, and other related programs. Please help us continue to work for you! Thank you. Donations may be made by mail or on this website.